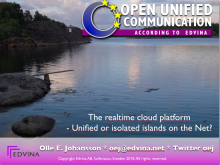 The Realtime Cloud – unified or isolated islands on the net? Here’s a copy of the presentation delivered by Edvina’s Olle E. Johansson at the Telecom Management Association’s Cloud Computing Congres in Utrecht, the Netherlands in December 2010. View more presentations from Olle E Johansson.